The holiday season is upon us, which for you may mean that loved ones will come from across the miles to be with you in your home for holiday parties, New Year's Eve and the Super Bowl. Hosting is no simple task, but with a few key considerations, your home will be the perfect place to welcome guests. Bars are all the rage now, including carts with bars or using a chest as table top. 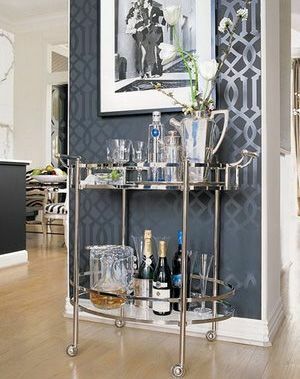 Whether it's alcoholic or nonalcoholic, it is important to have a set up so that when people enter your home they can automatically feel comfortable helping themselves with something to drink. Complete your bar display with a crystal bucket filled with ice, a decanter set with the special punch ready to serve. The use of metallic pieces within your decor, like gold and silver, will glimmer and glisten in the light. Never worry about mixing metals - silver and gold have been used together ever since watches came out. If Rolex or Breitling can mix the metallic colors to create a luxury item, we can certainly use them in our homes to evoke the same feeling. If children are invited to a holiday function in your home, be sure to have a corner set aside for them with a small table and chairs, and any special dinnerware, such as sippy cups or smaller utensils. 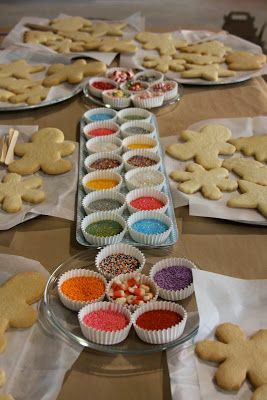 Consider making holiday treats available to them, or providing an activity like decorating cookies. When setting your holiday or special occasion table, regardless of whether it's casual or formal, a simple way to make it festive is to add decorative napkin rings. I've always enjoyed taking a Christmas tree ornament and using that to tie around the napkin. For a more earthy look, spray paint pinecones with gold paint and use burlap twine to tie them over the napkin. Of course, there is always the option to go to a greater expense and buy a glittering object from Neiman Marcus. Remember, filling your home with holiday cheer does not mean that you have to spend a fortune - it can be as simple as making people feel at home and comfortable. Keep in mind that these tips can be used throughout the year, and are not exclusive to the holiday season!